Andrew Proverbs Review. 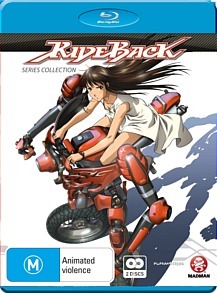 Rideback features some great presentation, likeable characters and a large helping of action. It’s a charming twist on the mecha genre. First appearing in manga magazine Gekken Ikki back in 2003, ‘Rideback’ is the story of a young ballet dancer named Rin Ogata. When Rin seriously injures her leg during a performance, she starts to lose her way in life- that is, until she discovers the thrill of piloting a Rideback. After a chance encounter with a local club who operate these robot-motorcycle hybrids, Rin instantly bonds with one in particular- called the ‘Fuego,’ or ‘Fire’ in Spanish. It all starts out innocently enough- Rin takes part in a few races, and does well thanks to her ballet-trained agility and reflexes. But she is soon caught up in events bigger than herself, when terrorists attack the city and she is mistaken for one of them. There are lots of big things going on in this series: there’s an oppressive world-wide government, who are trying to sink their claws into Japan. There are political tensions, attacks, protest demonstrations and bombings. But to be perfectly honest, that side of the story didn’t really interest me. I was more interested in Rin’s personal journey, and her search for an identity. Her character has spades of charm right from the beginning, when we are introduced to her on stage. She has her own simple yet stirring soundtrack, which re-occurs in more dramatic forms throughout the series. As a character she is imperfect, often lacking confidence and holding her head down. She’s drawn in a simple, yet beautiful way, constantly wearing a white dress, with stray strands of hair sticking up. You can’t help but like her. A special mention needs to go to the design of the ridebacks themselves, which are awesome to look at. They are all built on the same design template, but each one has its own style details in terms of headlights and cowling, even engine sound. The only flaws which come to mind are in regards to the plot. While the over-arching story is good and has a satisfying conclusion, there are some little issues in terms of continuity that sometimes get in the way of the experience. As an example, Rin’s brother Kenji is locked away during one episode. The last shot of him you see is when he is taken away, presumably to some dire fate, but it never comes up again during the series. And when terrorist leader Keifer, locked in mortal battle with a GGP (government) soldier, gets the upper hand, the scene cuts away. You assume from that vision the GGP man would have died, yet he turns up safe and sound later on. As is standard with most anime releases, you get the opening and closing title songs, as well as trailers. Commentary is also provided for two of the episodes. Rideback features some great presentation, likeable characters and a large helping of action. It’s a charming twist on the mecha genre.